ONE Fighting Championship held a blockbuster press conference last March 18 at the SM Mall Of Asia Atrium in Manila, The Philippines, in anticipation of the upcoming epic event, ONE FC: RISE OF HEROES happening on May 2, 2014. 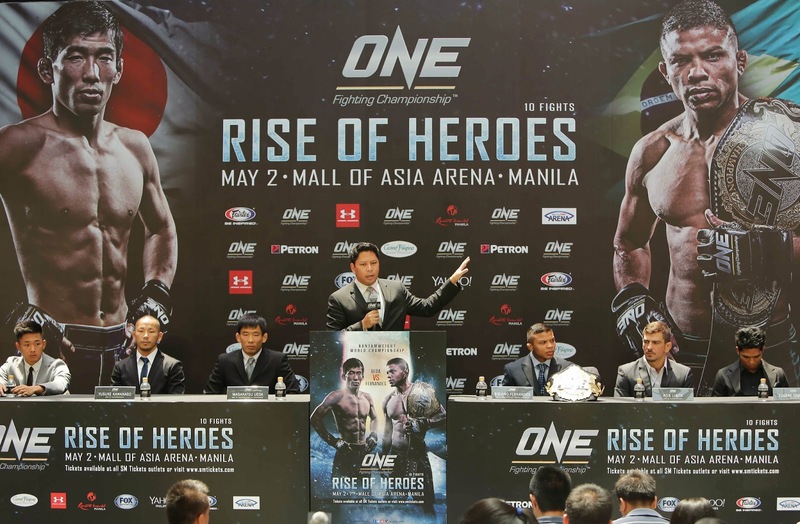 ONE FC: RISE OF HEROES is set to be the largest mixed martial arts event ever witnessed in the history of the Philippines. To be held at the 20,000-capacity SM Mall of Asia Arena in Manila, the event promises a stacked fight card featuring the explosive battle for the ONE FC Bantamweight World Championship title belt in the Main Event. Millions of MMA fans around the world have been eagerly anticipating this moment when the ONE FC Bantamweight Grand Prix winner, Masakatsu Ueda, will rise up to challenge the reigning and defending world champion Bibiano Fernandes for the honor of being crowned the ONE FC Bantamweight World Champion. The stacked card also includes a Featherweight clash between the best Australian Featherweight, Rob Lisita, and the former Legend FC Bantamweight Champion, Yusuke Kawanago. It will also feature the young and motivated Filipino hero, Eugene Toquero, who will soak up the passionate support of the screaming Filipino fight fans as he faces one of the top Flyweight prospects in the world, Gianni Subba. Tickets for ONE FC: RISE OF HEROES are on sale now at SM Tickets (www.smtickets.com). Ticket categories begin with the full Red Carpet and cageside experience for VIPs at PHP 6,360 followed by Patron at PHP 3,180, Lower Box PHP 1,280, Upper Box at PHP 640 and General Admission at PHP 220.